Renowned as one of the world’s greatest screenwriters, Woody Allen has written and directed around fifty films in five decades, releasing at least one every year since 1982. Unsurprisingly, given his prolific output, Allen’s films tend to be somewhat erratic in quality, but at their best they offer unparalleled insight into the complexities of social interactions and idiosyncratic neuroses. His latest film, Blue Jasmine (2013, screening at the Ultimate Picture Palace for two weeks from Friday 25th October) further expands upon the themes of three of his other recent major offerings: Match Point , Vicky Cristina Barcelona , and Midnight in Paris . Blue Jasmine begins with a formerly wealthy socialite (Cate Blanchett) arriving in a poor area of San Francisco following a flight from New York. After arriving at her sister Ginger’s ‘homey’ flat, she reminisces about the luxurious life that she once lived with her husband Hal (played by Alec Baldwin). She clings to the riches of her past, travelling first class despite being broke, and retaining an air of imagined superiority over those that have never been as economically fortunate as she once was. Born as Jeanette, we learn that Jasmine chose her new name because she found it more romantic, a small but telling detail that underlines the extent to which she self-fashioned her image and lifestyle. Blanchett’s committed depiction of Jasmine’s mental fragility has received unanimous praise, and it often adds newfound nuances to Allen’s script, grounding its broad thematic subjects – greed, materialism and class differences – in a fascinating character study. A preoccupation with financial and social success also pervaded, and complicated, the primary relationships of Match Point and Midnight in Paris. In the former, Jonathan Rhys Meyers’ character Chris embarks on a passionate but risky affair with Scarlett Johansson’s Nola. Throughout the film, he is torn between choosing love – Nola – or a life of comfort and financial security with his newlywed wife Chloe (Emily Mortimer). Chris’s questionable morals are the driving force of the film, and it is clear that he fears Chloe discovering the affair not because he would lose her, but because he would lose the privileged socio-economic position that she enables him to have. If Chris desperately chases such a lifestyle, then the protagonist of Midnight in Paris, Gil (Owen Wilson), actively avoids it. Gil’s fantastical escapes into the Parisian past serve to distance him from a modernity that he has become disillusioned with. His relationship with his fiancée Inez (Rachel McAdams) is tested as her lifestyle, ambitions, and ideas of beauty grate against his. Gil wishes to move to Paris permanently, entranced by the beautiful nostalgia of the city, which he believes is at its most beautiful in the rain. Inez, in sharp contrast, longs to live in Malibu, both in the moment and in unashamed materialism. Related to such ideological conflicts in Allen’s recent major films is the theme of marital decay. In all four films mentioned above, a marriage or engagement ends badly, be it with Match Point’s dark secrets, the neurotic ex-wife (played by Penélope Cruz) in Vicky Cristina Barcelona, or the break-off of the engagement in Midnight in Paris. 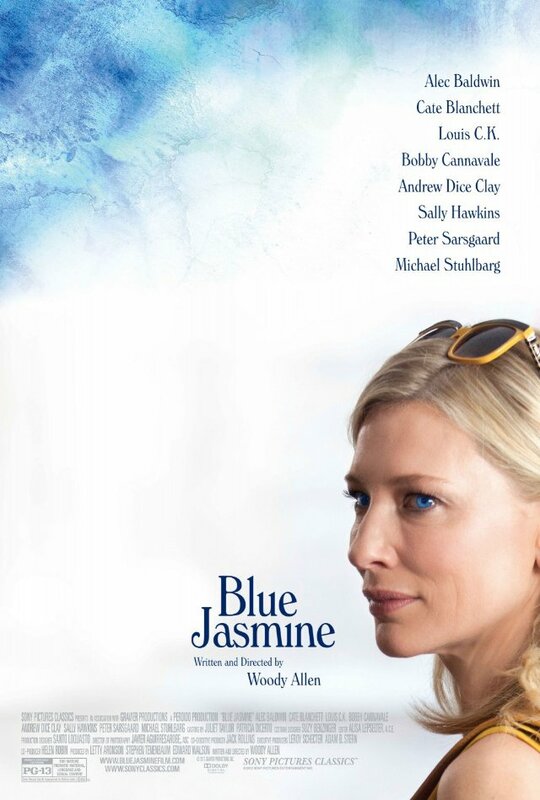 In Blue Jasmine, Hal’s questionable business affairs – and romantic affairs – are initially ignored by Blanchett’s character, who chooses self-delusion in order to keep her romanticised lifestyle intact. Such denial, present in many of Allen’s characters, prevents Jasmine from escaping the road to self-destruction until it is too late. Many discussions of Blue Jasmine have drawn attention to the film’s likenesses to Tennessee Williams’ A Streetcar Named Desire, and the number of parallels present suggests that Allen was inspired by the play, whether Jasmine is intended as a literal updating of Blanche DuBois or not. Like Blanche, Jasmine is all too aware that her life is in decline, as much as she tries to convince people – and especially herself – otherwise. Ginger’s role is clearly analogous to Stella’s; Jasmine relies upon her sister while looking down on her and scrutinising her relationships. Even these relationships seem to correspond to Streetcar, as Ginger’s burly boyfriends recall Stanley Kowalski. That Baldwin and Blanchett have both starred in high-profile productions of the play certainly seems to be no coincidence. Blue Jasmine is only the second film Allen has shot in America in eight years, with the recording of other recent films having taken place in cities across Europe. Location played a key role in many of Allen’s earlier films – Manhattan being perhaps the most obvious example here – and Vicky Cristina Barcelona, Midnight in Paris, and 2012’s To Rome With Love all make Allen’s emphasis on place explicit. Allen’s ‘European era’ films, however, have received criticism from some, who have perceived them as gimmicky ‘picture postcards’ in which the setting becomes exploited at a shallow visual level rather than performing any active role. Blue Jasmine, in contrast, offers a more conflicted relationship with its setting. David Jenkins has referred to the film’s use of San Francisco as a ‘city requiem’, compared to Manhattan’s ‘city symphony’, and this certainly reflects Jasmine’s perspective. If New York was the place of her dreams – initially, at least – then San Francisco came to be the place of her nightmares, symbolising an ordinary, mundane, working-class existence. Allen himself, however, has nothing but compliments for San Francisco, suggesting that Jasmine’s dislike for it (and the ‘requiem’ feel that this brings to her surroundings) says more about her than it does about the city. San Francisco – along with Ginger’s family – provides Jasmine with a shocking reality check: the lavish lifestyle that she cultivated in New York might have given her temporary pleasure, but Allen and Blanchett are keen to remind the audience that this was at the expense of love, happiness, and mental well-being. Other films screening over the course of the next two weeks are Captain Phillips (Phoenix, from Friday 18th); Le Week-end (Phoenix, from Friday 18th); Pieta (UPP, from Friday 18th); Rush (UPP, from Friday 18th); Enough Said (Phoenix, from Friday 25th); and Metro Manila (UPP, from Friday 25th). There are also one-off showings of The Wicker Man (Phoenix, Sunday 20th and Wednesday 23rd); The Shining (Phoenix, Sunday 27th); Gloria (Phoenix, Friday 25th); The Big Lebowski (Phoenix, Friday 25th); Thank You For Smoking (Phoenix, Saturday 26th); Project Wild Thing (Phoenix, Sunday 27th); The Artist and the Model (Phoenix, Tuesday 29th); Come As You Are (Phoenix, Wednesday 30th) and Halloween (Phoenix, Thursday 31st). UPP will be showing films for both the Thrillseekers Adventure Film Festival and OxDox 2013; see our previous column for a discussion with OxDox’s Festival Director, Marie Wright. For up-to-date cinema listings and to book tickets for any other films currently showing please follow these links: Phoenix Picturehouse; Ultimate Picture Palace; Odeon George St; Odeon Magdalen St. If you know of any film events or showings that you think should be included here in the future then please e-mail J. Wadsworth at theoxfordculturereview@gmail.com.